I went to see this movie, first and foremost, because I’m a sucker for superhero movies. Sure, the kids wanted to see it also, but I went with low expectations because The Dark Night (2008 – and 4 years ago already?) did everything so well that I could only foresee a letdown... a return to a Batman that I don’t care about, a plot without any moral substance, and/or a paper-thin villain with no real reason for being evil. Like all the other superhero movies. The Dark Knight Rises was a pleasant surprise. Christian Bale’s Batman was never one to be liked, per se. But compared to Michael Keaton or Val Kilmer, he brought a certain edge to the character that was sorely needed. That remains in this installment. Bruce Wayne remains an unsympathetic but driven character, who the audience understands will rise to whatever occasion and do the right thing. Angst and obstacles aside, the character does not need a lot of development to return to his heroic moments. That leaves the plot and the establishment of a moral tension. It should be noted that I didn’t particularly care for the first movie in the Dark Knight reimagining. The travails of Bruce Wayne in the forming of his athletic training and sorting right from wrong... okay. The straw-man reasoning for the Gang of Shadows’ desire to destroy Gotham... not convincing at all. Yet here they return, with the same intent, but with a different leader, Bane. 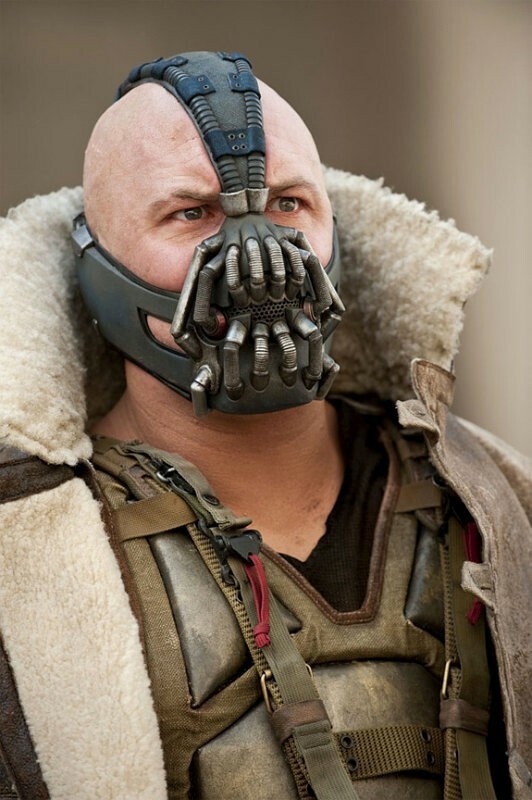 To Bane’s credit, he commands attention every moment that he’s on the screen, but he’s been seen before, all the way back in 1977 when he was wearing a black helmet with a respirator and boasting a similarly rich, projecting voice. There’s a certain element of comic book silliness that goes along with his many minions and whatever threat they’re building, but he’s a curious character who is, in time, satisfyingly sketched. He’s not Heath Ledger’s Joker, but he isn’t a lame Mr. Freeze, either. And then there’s the tension. Never mind the post 9/11 psyche of a Gotham/NYC that has taken its lumps and is now faced with a more cataclysmic threat. That’s just a fertile setting. The plotting genius is to take the recent political class warfare “Occupy” demonstrations and fast-forward the movement to its implied but natural conclusion: The removal of the 1%, a “People’s Court” a la the French Revolution, and a state of anarchy resulting from a new definition of justice that empowers the dispossessed within the 99%. It’s fairly easy to recognize current events within the movie, but I can’t help but wonder if the audience conveniently separates current events as they watch the fiction unfold. Does it make them nervous? It should. And after Batman removes the bad guy and the City returns to a peaceful state, does anyone consider who will be left to lead after the purge? The second best? Third? Twentieth? Ah, that other notable element. The eye candy. There’s no question Anne Hathaway fills out the Catwoman costume, um, suitably. If that’s the sole point, then it’s definitely a casting success. But when you think of a Cat Woman who steals jewels and fights craftily, there’s a certain nimbleness implied, an edge to the jaw structure, a cattiness about her eyes. All I see is a very shapely Princess Bride. Our President commented that “I did get a chance to see Batman. And she was the best thing in it.” I’d really like some clarification. She clearly was the best looking thing in it, but I don’t think he would risk a sexist comment, this being an election year. Was she the best actor? Well, maybe? No? Despite some big names, the movie was absent a great acting moment. The material is necessarily limiting. Or, was she just a convenient diversion from his real interest? Given his political rhetoric and societal vision, I would have expected that such a candid President would have been giddy at the depiction of a New American Order that equalizes the playing field for those who work for their money (in context, actually labor for their money, as opposed to others who use intellectual power). For those who favor social justice, anarchy may not be desirable, but it is assuredly the faster means of achieving those goals than the slow bleeding achieved in a legislative tack.